All the tatting shuttles that were delivered last weekend to Jane have now been sold, it's incredible how fast they went, so it is time to make some new ones. 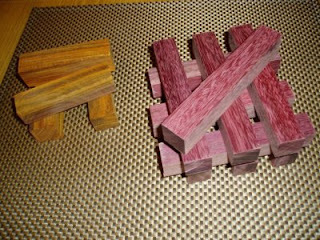 "Im in the garage" has been buying wood off e.bay, exotic woods that will look very beautiful when made into shuttles. But there is a little story behind the wood you see below, it has come from America and is cocobolo rosewood and purple heart. After it was ordered and paid for, the person in America sent an e.mail to say that he was sorry but he had been rushed into hospital for emergency surgery but would post the wood as soon as he could. So we thought, the poor fellow must have had an appendix removed or something like that, so we sent our good wishes for a speedy recovery and said there was no hurry for the package to be sent. However, in due course the parcel did arrive, sadly not in a very good state, the Royal Mail had put a polythene bag around the original package and our first thoughts were, have we lost any of the wood? 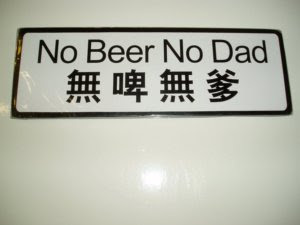 Delivery was also delayed to our home as we were away visiting family when it arrived on Saturday. In the meantime another e.mail was received from this poor chap to say that the reason he was in hospital was that he had cut his thumb off whilst using the table saw! Yikes!!! No the thumb wasn't in the package, he had it sewn back on again, hence the emergency surgery! And no there was no blood on the wood either! And yes all the wood was enclosed in the re-formed package. But this wasn't the first consignment of wood ordered on e.bay. I received a phone call two weeks ago from someone in England who had posted a parcel to us, it had arrived safely to our home and was ready to be opened by "im in the garage" when he returned from work. 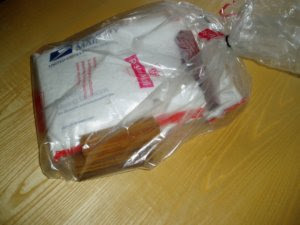 However, this fellow asked if I wouldn't mind opening it because he thought he had sent the wrong item! Too true! 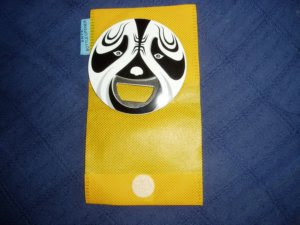 When I opened the package there were these plastic strips! Apparently he normally does the cutting and leaves the admin work to someone else, but they were away so he had to do it himself and sent our wood to the person who was meant to receive the plastic. So the fellow who received the wood forwarded his parcel onto us and we sent ours to him. But these bits of plastic were so pretty I almost kept them! 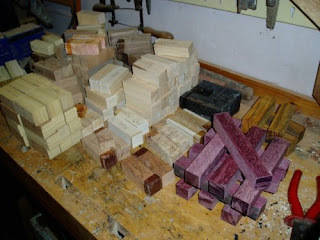 Now here is the vast collection of different woods ready to be made into shuttles, there are about 17 different varieties of wood in this picture some are English woods and others are woods that originate from other parts of the world. 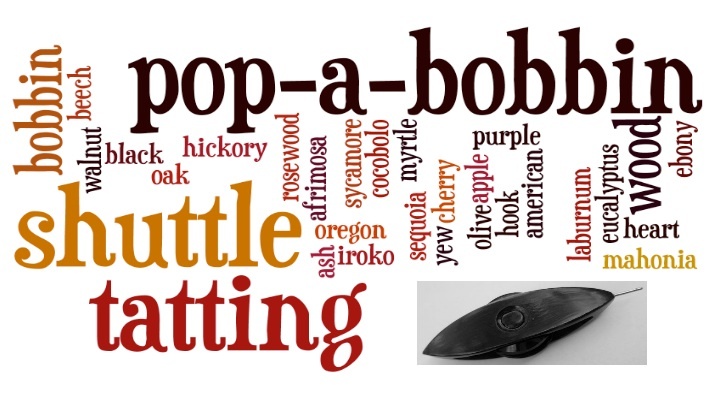 So the excitement grows as we all wait to see how the exotic woods will look when made into tatting shuttles, I think its time to put my order in! 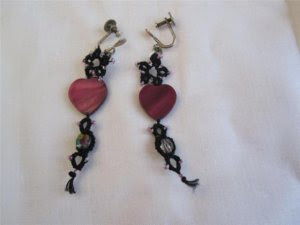 Now one of the things you will notice straight away is that these earrings are for non-pierced ears, thats me! So I actually wear these myself. 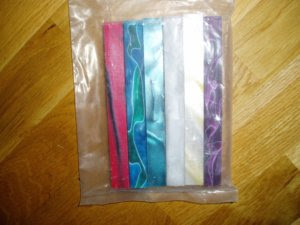 I found the mother of pearl hearts at a car boot sale, a small packet of them in different colours, but good strong colours. I have only used the two hearts shown here so far. The glass beads I found in an antique shop, they were broken and were in a little plastic packet so were priced very reasonably. 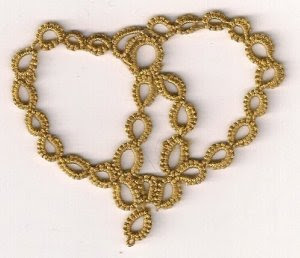 I have not had time laterly to do much tatting due to the pop-a-bobbin shuttles and a very busy life. So shall we have a little peep in the garage? In the container are some shuttles that have been cut out and sanded, before varnishing. Now you can see "im in the garage" sanding them on this clever bit of equipment. We went to see Jane on Saturday and delivered 30 shuttles, most of them have now been sold. In the last week quite a few different woods have also been delivered to our house, so there is soon going to be a bigger variety of shuttles to choose from. I will try and find out what these woods are and then let you know. That is one thing about wood it changes so much as it is worked on, an ordinary block comes alive after it has been cut and shaped, and the beautiful grains are exposed. Tatting shuttles certainly lend themselves to being made out of wood. Today is Shrove Tuesday the day that we make and eat pancakes to symbolise the using up of the food supplies in our home, ready for the penitential season of Lent, which starts tomorrow Ash Wednesday. Shrove is taken from the old English verb shrive, meaning to obtain absolution for sins. It is also quite common on this day to have pancake races, with groups of people running along the street with frying pans and tossing the pancakes as they run. No this is not a tatted valentine heart gone wrong! It is supposed to be a pretzel. Pretzels I discovered have a deep spiritual meaning for Lent. In fact, it was the ancient Christian Lenten bread as far back as the fourth century. In the old Roman Empire, the faithful kept a very strict fast all through Lent: no milk, no butter, no cheese, no eggs, no cream, and no meat. They made small breads of water, flour, and salt, to remind themselves that Lent was a time of prayer. They shaped these breads in the form of crossed arms for in those days they crossed their arms over the breast while praying. 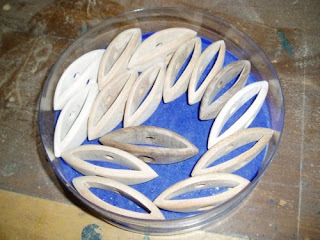 Therefore they called the breads "little arms" (bracellae). From this Latin word, the Germanic people later coined the term "pretzel". 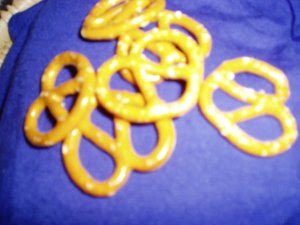 So in church on Sunday I gave every one a little bag of pretzels tied with purple ribbon, the real ones not tatted ones! Of course Sunday coincided with Valentine's day so may be I should have tatted them all hearts! Now it was forty years ago this week that we here in England said goodbye to our beloved £ s d.
Or pounds, shillings and pence. 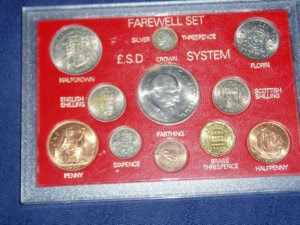 Here is a farewell pack, to remind everyone of the days when there were twelve pence in a shilling. Which leads me on to say that Lent consists of forty days and forty nights - a time when people choose to give up something for Lent, like wine or chocolates and give the money they would have spent on these luxury items, to a worthy cause. Other people take on more tasks during Lent. All I can say is that in our house we will still be eating, milk, butter, cheese, eggs cream and meat during Lent! After all 'im in the garage' needs them to give him energy to make more shuttles! Here are the wood blanks ready to be shaped into shuttles, note the ebony on the right of the picture, which arrived by post this week. Last Saturday morning you would have seen me walking through the streets of our nearest town carrying an adult beaver costume in one hand and a parcel containing tatting shuttles in the other, as I made my way to the main Post Office. If I had been wearing the beaver costume people would have probably noticed me! Instead as I queued in the Post Office, I looked like any other person on a busy Saturday morning. After a little while I was directed to a counter by a number and handed the precious little parcel to the woman working there. She did ask me if there was anything valuable inside, anything valuable?! Of course there was, but she hardly wanted to hear that it contained tatting shuttles, she probably didn’t know what a tatting shuttle was. I said farewell to the shuttles and wished them a safe journey from the South to the Middle of England and they duly arrived at my sister’s house on Monday morning. In the afternoon she started to sell them and now they are all gone, it was amazing how quickly they sold and some are probably still flying around the world somewhere! Hopefully, there will be quite a few shuttles ready by next weekend when we plan to take ourselves and the shuttles by car to the Midlands. 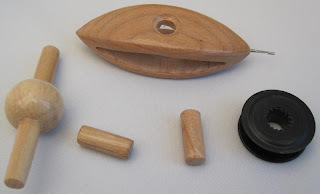 INTRODUCING THE POP-A-BOBBIN SHUTTLE . . . . . . . . . .
After a few disappointing and frustrating set backs with the design of a wooden shuttle that would have a removable bobbin and did not involve too many complicated parts, we have now come up with what we believe is a unique and clever idea. Here it is prior to being assembled (with an extra plug). 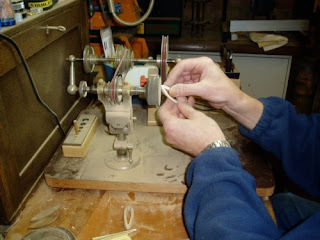 The bobbin is placed in position and a plug is pushed through the centre hole of the shuttle and through the bobbin. To remove simply use the popper tool on the left of the picture to push out the centre plug and listen to the pop! The popper tool is tapered at one end in order to push out the centre plug. 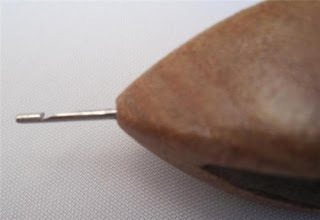 The plastic bobbin can be placed on the other end of the popper tool to wind thread. The hook on the end of the shuttle is also handmade from stainless steel. It is hoped that those who use this tatting shuttle will find it comfortable and practical to use, especially as there is a slight indent for your fingers in the middle. I wanted to show you this shuttle earlier but due to the extremely bad weather that hit England working on them became impossible, and then of course Jane and myself needed to test them. Many of you prefer a shuttle with a removable bobbin, as it easier to wind/unwind and usually holds more cotton However, my shuttle maker (aka husband) can make post shuttles but he is at the moment concentrating on these bobbin ones. Again some of you do not like a hook attached to the shuttle, there will be some that will be made without hooks, don’t worry – just let Jane or myself know if that is your preference. You may be wondering how you can purchase one of these shuttles - well 10 of them are at the moment winging their way to Jane’s home via the British postal service and as soon as she receives them they will go into her Etsy shop, hopefully before the end of the week. 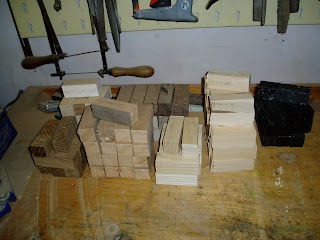 The shuttles are being made in a variety of British woods, which include elm, cherry, walnut, ash, sycamore and cedar. We are in the process of buying some exotic woods such as ebony and iroko to make them from but obviously these will cost a little extra. I will show you one of them in a future post. The shuttle is to some extent modelled on the Aero shuttles, but of course with the wooden plug in the middle there is no clicking sound! 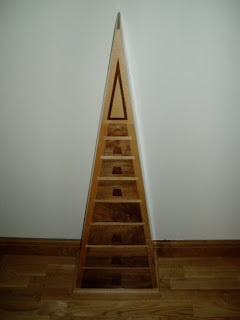 As some of you will have already realised my husband is a very talented woodworker so this is a really good way of combining our talents, and with the invaluable help of Jane, who passed on her suggestions during the project we hope that we have come up with a shuttle that will be a faithful friend to the many tatters around the world. You all should know by now that Jane is my sister, we were both taught by our grandmother to tat when we were children, Jane being a little older took it more seriously than I did at that time. I've only come back to tatting with renewed energy in the last 10 yrs, so have lots of catching up to do! After this post I'm sure we can rightfully be called "The Shuttle Sisters"! I love wearing necklaces, especially colourful ones, and before I ramble on about mine you must look at these fabulous creations on Martha's blog here, made with buttons and nuggets, they are so clever. The purple tatted necklace I made for someone called Robin, she is the niece of Robin my friend, mentioned in Jane's blog here. It was tatted during the Christmas holidays and I was able to give it to Robin in person, when she was in England for a week at the beginning of January. Purple is her favourite colour. I can't stop buying beads especially when I see them at car boot sales or the tip, and it was getting to the point when I was just storing so many beads and not doing anything with them. 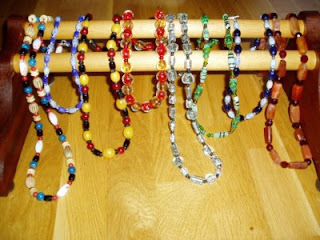 As I had acquired such a variety of beads over the years, it was such a shame not to use them. They had been stored in containers, never to see the light of day. So last week I scattered the beads all over the floor, and I duly set to work, matching the various shapes, sizes and colours and stringing them. 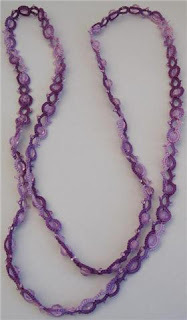 They were also joined by other beads taken from broken necklaces. These are results of my labours, but I have to admit there are still some more beads hidden away! In case you are thinking gosh where does she store all these necklaces? Well this is the piece of furniture I store them in, and you can all guess who made this large jewelry cabinet! In the next post I will show you the new shuttles.